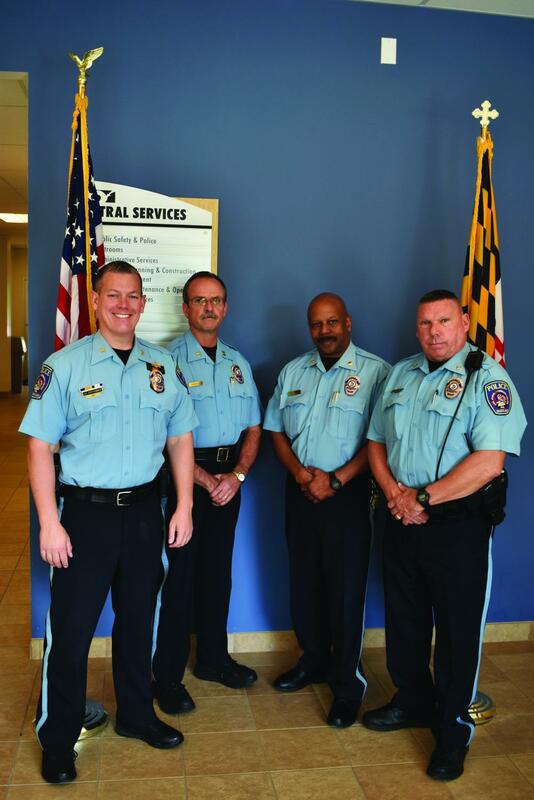 Police Chief Sean Kapfhammer (left) poses with three of the four former SWAT officers who work at AACC: Capt. Dave Pressley, Maj. Cleveland Smith and Officer Don Medtart. It’s about 1 a.m. in Baltimore, when the smell of smoke from burning trash and towels leaks out from under a closed front door. The sniper covering the rear of the house confirms over the radio that a barricaded gunman had set a fire inside of his home. Don Medtart rushes into the burning building, carrying a ballistic shield, to arrest the dangerous assailant. That was about 10 years ago. Today, Medtart is one of four police officers on campus with Special Weapons and Tactics—or SWAT–team training and experience. The Department of Public Safety and Police employs both full-fledged police officers who wear light blue shirts and carry guns, and public safety officers, who carry billy clubs and dress in dark blue. Like Medtart, all of those officers spend their days on campus enforcing traffic laws and jump-starting dead car batteries, says Major Cleveland Smith, another retired SWAT officer. But he says the department is fully prepared to respond to more serious threats, like an active shooter on campus. Medtart says he is concerned about the possibility of a campus shooting, but says the officers train extensively for it. “The hundreds of hours of active shooter training that I have been through has been the most effective tool [to prepare],” Medtart says. A witness at Pizza Hut, Smith says, was slowly giving a 911 operator a play-by-play of the robbery while Smith waited to go in. “I just was amazed at how one person’s actions can affect so many people’s lives,” Smith says. Medtart has a story, too. He recalls arriving at The Johns Hopkins Hospital after a doctor, a patient and the patient’s son were shot in a murder-suicide. Campus Police Chief Sean Kapfhammer says he is proud of all of his officers, especially the former SWAT team members.